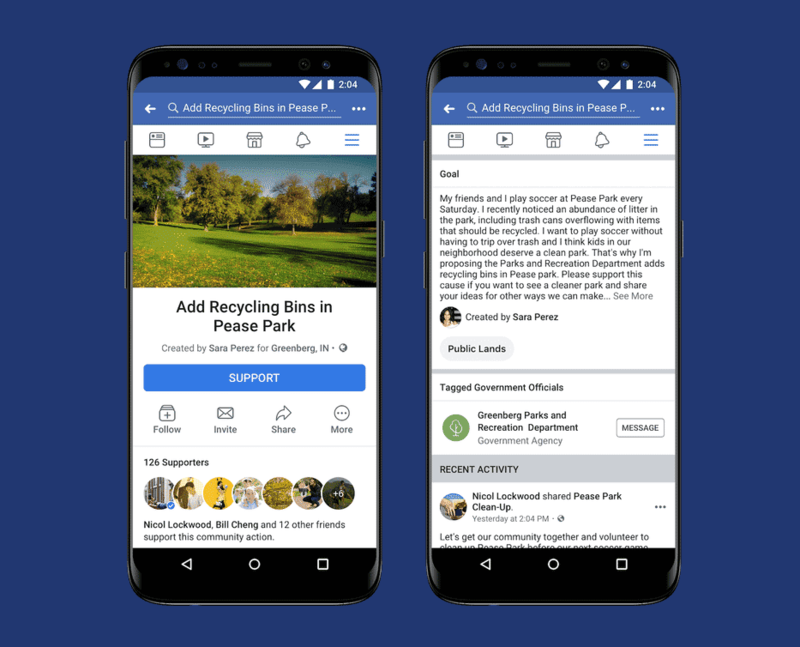 Facebook to help users with Social Causes through "Community Actions"
Change.org is about to get some competition very soon as Facebook is working on launching a petition feature which will allow a user to create campaigns based on social causes that others can support. The addition of this feature can be attributed to Facebook’s recent attempts to introduce community-based tools to get users to take interest in politics, local government and other social aspects around them. TechCrunch reported that the petition will focus on bringing the attention of concerned people/party to the local causes. "New! Tools to Organize and Mobilize. Support a community action to advocate for an issue you care about. Invite people to add their voice and take actions to support it. ", read Facebook's new action explore page. The feature is going by the name, “Community Actions” and has already become functional as of today. All a user has to do is create an “Action” by providing the title and description of the cause. They should then have the concerned authority tagged so they can start looking into the matter. Like change.org, other users can help the petition by “supporting “or sharing it. Supporters can also have discussions regarding the cause and the required action. However, the cause can only be discussed by the users who have supported it. There is no dedicated functionality to express disagreement with the cause as of now. As it’s said that nothing is perfect and with every revolution comes a few setbacks as well. Moderation is one of the most important concerns for this feature. The feature can be used for immoral uses or for spreading hate or inaccurate information. In addition to that, the destructive criticizers can simply support the petition to spread hate in the discussion section. Thus, Facebook will have to go above and beyond to implement such a moderation process that will filter trouble-seeking posts from the actual issues related to the cause. According to media reports, Facebook will use a combination of flagging and detection algorithms to prevent any such mishap. In addition to that, many government officials will be provided a “constituents” badge so the supporters can know when those officials post a comment regarding the issue. If everything goes well, this Facebook feature will surely edge out its change.org counterpart as Facebook has a much larger following as compared to change.org. Moreover, supporting a cause with just a click on one’s news-feed sounds quite convenient. Only time will tell how it turns out.